In a fit of health consciousness, I went a little crazy at the market and bought several large bunches of local kale. When washed, it amounted to more than 30 cups. Yes, you heard that right: 30 packed cups of kale! I love kale, but this was a little much even for me. Kale has been going into everything lately from eggs to potatoes, from soup to salad. But no matter how much kale I use, the pile doesn’t seem to diminish much. It’s the neverending pile o’ kale! I took advantage of this kale-pportunity to try out another way to make polenta. Polenta is one of those things that is just elemental, like roast chicken or omelets. There are a million ways to make polenta. You can make it in the oven, the slow-cooker, the microwave or on the stove. You can cook it for 15 minutes or hours. You can spread it out onto a sheet pan and cut the hardened polenta into squares. You can deep-fry leftover polenta. The smallest amount of corn meal seems to make mountains of polenta. It’s a polenta-palooza! Great to pair with the neverending pile o’ kale, no? This polenta-making technique is from those fiddly folks at Cook’s Illustrated. It only takes 30 minutes of minimal whisking to achieve creamy polenta perfection. And, as you can see, my CSA has goose eggs! Which are big honking suckers 😉 The equivalent, more or less, of two chicken eggs. There are a million ways to poach eggs too, but lately I have been liking Food52’s Control-Freak Poaching Method. 1. In a large, heavy Dutch oven, bring the 6 cups of water or stock almost to a boil with the lid on. Uncover the pot and season the water or stock with salt. Vigorously whisk the corn meal into the liquid a little bit at a time. As you whisk, be sure to get in all the corners and edges of the pot with the whisk to ensure that there are no lumps. When all the corn meal has been added to the water, cover the pot again and reduce the heat to low. Let the polenta simmer, stirring every 5 minutes, for 30 minutes total. 2. In the meanwhile, melt 2 tablespoons of butter with a little bit of olive oil in a large skillet set over medium heat. When the butter begins to foam, add the minced garlic and the mushrooms. Sauté the mushrooms until they give up most of their liquid and begin to turn golden. Add the white wine and as many red chili pepper flakes as you like. Season the mushrooms with salt and pepper. When the liquid has reduced to almost a glaze, add the kale to the pan and cover the skillet. Let the leaves wilt completely before stirring the kale and mushrooms together. Adjust the seasoning for a final time and remove the pan from the heat. 3. After 30 minutes, your polenta should be done. Move the pot away from the burner and vigorously whisk in the butter, one tablespoon at a time, until it has all been well-incorporated and the polenta is creamy. Stir in the Pecorino or Parmesan and adjust the seasoning. 4. In a medium-sized saucepan, bring about 4 to 5 inches of salted water to a near simmer. Carefully crack a goose egg into a small fine-mesh strainer. You want to separate the yolk and the more solid part of the white from the more watery part of the white. Carefully pour the egg into a large, shallow spoon. Gently lower the spoon into the water. Use another spoon to catch any bits of white that try to escape. When the egg is perfectly poached, the white should be opaque and when you gently move the egg back and forth, the white and the yolk should move in sync. When the egg is done, lift it out of the water and very carefully roll it onto a paper towel-lined plate. 5. To assemble the dish, spoon out about half a cup of polenta into a large, shallow bowl. Top the polenta with about a third of a cup of the spicy braised kale and mushrooms. 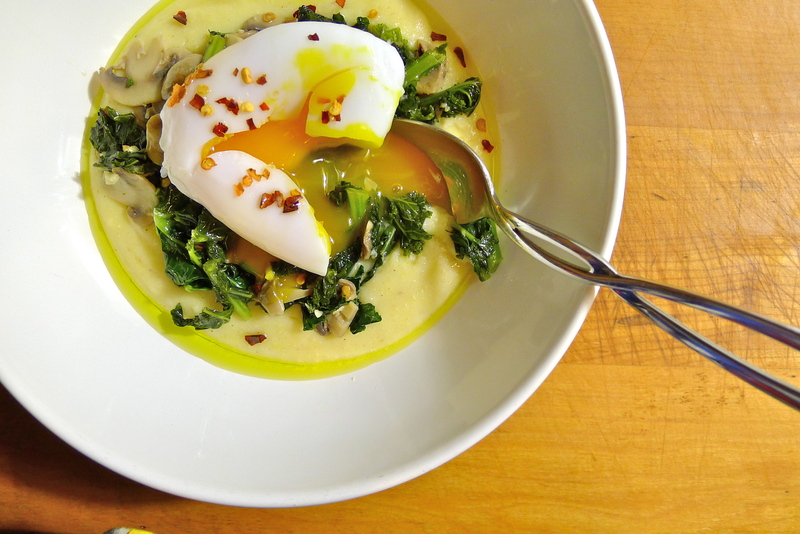 Carefully position the poached egg on top of the braised kale and drizzle everything with good olive oil. Serve immediately. You’re rocking on the eggs these days! I overbought kale at last weekend’s markets also, so am glad for the idea. Looks great! You too? I bet you didn’t buy as much as me. It took three sinks full of water to wash it all. I must be out of my mind! What was I thinking?! Punny is as punny does! That’s a great looking bowl. Perfect egg! I know. I think most of it is going to get turned into pesto today. Just have to go out and buy a ton of olive oil! What does a goose egg taste like? Is it very similar to a chicken egg? One of our neighbors has geese. They make the cutest darn quacking noise. I want one!!! Goose eggs taste kind of like duck eggs? I kind of like duck eggs more . . . The yolk has a really rich taste, but the whites are kind of strange. They’re not really “rubbery,” but they are definitely bouncier than chicken egg whites. I think it’s a little bit like goat’s milk: I just have to get used to them! I think you should totally get a goose! It sounds like duck and goose eggs may be an acquired taste or maybe a taste you have to grow up with. I’d love to get some ducks and some geese. They’re so incredibly cute. I think you should get a whole menagerie! Do you think Wheaky would talk to the ducks and geese too? He and Ruby are so cute! I’m a fan of duck eggs too, so I’m going to try this, but with duck egg. Yay! Love duck eggs! I am learning to love the goose egg too. It’s a lot of egg! I am also slowly working my way through the kale. One big push should polish it off today. It helped to make kale pesto (which I gave half of to my friend, Laura). Still love kale, even after eating it every meal for a week! Dang! That’s a lot of kale! And look at that egg! You like your eggs exactly how I like mine. I’ve never had goose eggs before, though our online farmer’s market offers duck and quail eggs in addition to the normal chicken. I do like duck eggs, so I bet I’d like goose eggs, too! Did you end up making a big batch of kale pesto? So. Much. Kale. I can’t believe I used it all! I am learning to love the goose egg too. I think I like the taste of duck eggs more though. I just ordered some pullet eggs too. It’s an eggstravaganza! I made TWO big batches of kale pesto! Froze most of it and gave some away. If you are ever tempted to overbuy leafy greens, think of me! Thanks! I’m pleased at how it turned out too. Sometimes when I look back at the earliest photos on this blog . . . oh, my. I just shake my head and thank goodness that things improve over time! Thanks! After all that kale, I just feel kind of spent! But I still love it. I like poaching the eggs like that too! You have to really pay attention to it, but it turns out a beautifully poached egg. I hope you ate wonderful things with your visitors!